Prime Minister Narendra Modi’s ‘Make in India’ initiative has caught many eyeballs for its potential to unleash India’s latent manufacturing capability. There has been much talk about the initiative and how this thrust can transform India’s economy to the next level, much like a similar manufacturing boost transformed China in the 1980s. However, it is pertinent to point out here that in the 21st century, imitative manufacturing can yield only limited dividends. If we really want India to start manufacturing for the world, our thrust should be on innovation, not just production. Unfortunately, when it comes to earning patents at the international intellectual property regime, India lags much behind than much smaller nations, highlighting the lack of push and encouragement to innovation in this country. Patents do not just recognize a new creation or innovation but also reserve the right of profit from the particular innovation to its licensees for several years. This is why patents have become the new benchmark of innovation across the world. Unsurprisingly, the U.S., Germany and Japan are the countries that have traditionally lead when it comes to patent registration, and India remains a laggard. China, on the other hand, is the emerging leader in the field and in 2013 surpassed the USA in filing of new patent applications. Innovation has always been the key to economic transformation. In the 18th century, the west, especially the United Kingdom was home to the Industrial Revolution which boosted growth and brought about a transformation from subsistence to surplus production. Their manufacturing sectors witnessed tremendous development as technological innovations fulfilled their domestic requirements at lesser costs. Further, they were also able to export their products all over the globe and thus earned handsome profits. Investment on research and development helped their brands and products establish a foothold in both domestic and international markets. Under the Make in India initiative, we need to infuse a fresh life not just in the manufacturing sector but also in innovation. Not just by manufacturing, but by manufacturing innovative products can we transform the Indian economy in this century? This calls for a fresh thinking and long term vision. Short term benefits often dissuade Indian companies from investing in research and development, which requires greater gestational periods to yield results. This is why most of the Indian success stories such as in pharmaceutical industry have come not from indigenous research but from manufacturing products that are exempt from process patents. ‘Make in India’ program has been started with a view to make India a favorable global destination for Foreign Direct Investment (FDI). Further, the program desires to catapult India and popularize it as a better FDI destination than economic giants the U.S. and China. Other objectives of the program involve job creation, technological investment and skill enhancement; some features that our country lacks dearly. As far as India is concerned, the Make in India initiative has gathered a good response from both domestic and international markets. Optimists in India argue that the country has provided the world with several indigenous exports such as Yoga, the great Indian curry and many more but there is a huge paucity of ‘made in India’ global brands and a lack of investment in the research and development sector has led to this situation. Although big corporate houses such as the Tatas and Reliance have their presence in the international markets, a lot more needs to be done by Indian brands to gain global dominance. If Indian brands don’t play a significant role in the global village, the chances of India establishing itself as an economic superpower seem bleak. However, brands such as Bonita are changing the story with their international outlook and unsurpassable quality. With over 18 years of entrepreneurial experience in marketing and strategy, Umang Srivastava has an unusually accurate knack of understanding the needs of the consumer. 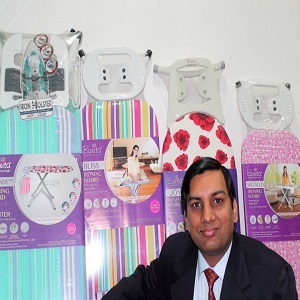 Umang is the Joint Managing Director of Bonita, the Indian Brand known for its high quality, stylish Home Utility products in laundry, storage, organizing and kitchen categories. He is a graduate from Delhi College of Engineering and has a PG degree in Masters in Business Economics from Delhi University.